Therefore we are interested in continuously advancing public discussions and hearings on refugee struggles and lager community strikes in Thüringen and on the successful campaigns that led to the closure of isolated lager camps since 1995 in Saalfeld, Jena Forst, Tambach-Dietharz, Katzhütte and recently to the closure of Zella-Mehlis in 2012. Other lagers were closed down in the early development of the refugee struggles before the Caravan tour in 1998. There were further solidarity actions in support of the successfull protests of the Tamil strike against the first lager ship in Bremen in 1994 and the later “jungle heims” as in Parchim in Mecklenburg-Vorpommern. Interestingly, it is known before the BUKO conference that the Bremen state wants to close down all their refugee lagers now (theoretically), after years of antiracist protests. Our discussion will be in the frame work of the Break Isolation Conference and Solidarity Act which starts on 8th of April in seven regions of Germany and will focus on the Refugee Tribunal Appeals – “Unite Against Colonial Injustice” http://www.refugeetribunal.org/ and the recent refugee lager community strikes in Nördlingen, Bitterfeld, Schwäbisch Gmünd and Wolfsburg. According to the transparent solidarity slogan of the Caravan for the rights of refugees and migrants: “We are here because you destroy our land” all sides and different points of view should be given a hearing in this process. We want to ride over the fears and keep the border regimes under control and expose the ideology of that dominant culture of colonial injustice in the World Order of global apartheid and oppression of the people of the world. Our struggles for freedom of refugee movement and against police brutality and the arrests of activists will be highlighted. 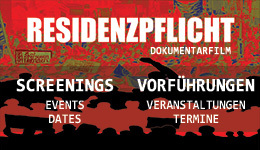 We will show films and video documentations and provide information materials on refugee struggles in Germany. *2003 Stop all deportations! Close all detention and deportation centers for refugees and migrants!